Jayadratha did not kill Abhimanyu directly. Yet he was held responsible for his death and Arjuna killed him the very next day. What is the story behind this? We shall see what role he played in the Kurukshetra war. Jayadratha may be one of the bad guys in the Mahabharata. However, his story is still important because it shows why Arjuna chose Lord Krishna to support him and be on his side even as a sarathi (charioteer). Jayadratha was on the side of the Kauravas, although this was not his first meeting with the Pandavas. Years before, when the Pandavas were in exile, Jayadratha had approached Draupadi and asked to marry her. 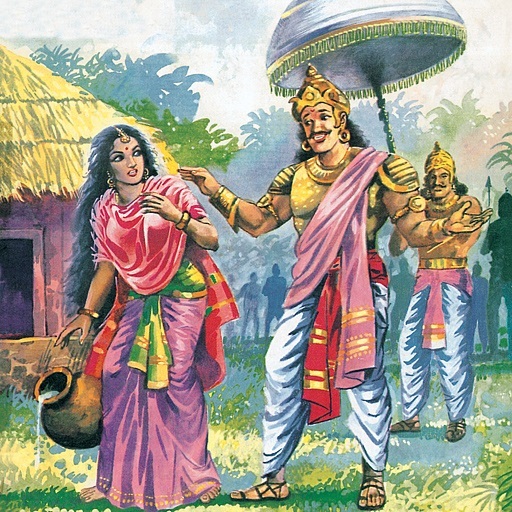 Jayadratha was the husband of Dushala and brother in law to Draupadi. Even though his aides had informed him that Draupadi was the wife of the Pandavas, he still approached her to ask her for her hand in marriage. However, Draupadi was disgusted by the mere thought of this and refused to yield to Jayadratha’s advances. So, Jayadratha abducted Draupadi and took her away in his chariot. The Pandavas were in exile at that time. When the Pandavas came back from their foraging, they were informed by Draupadi’s friend about what had happened. Yudisthira asked Arjuna and Bhima to bring back Draupadi and Jayadratha. After they had defeated and brought the king of the Sindhu kingdom back, the Pandavas wanted to kill him. Not wanting to make Dushala a widow, Draupadi pleaded with the Pandavas not to kill him. Instead, the king was to be treated like a slave and humiliated. Bhima shaved off the hair of Jayadratha leaving hair on five spots on his head. This greatly angered Jayadratha as he was humiliated a lot. After the Pandavas let him go, the king immediately started penance to Lord Shiva to extract his revenge on the Pandavas. After conducting an intense tapasya and prayer to the Lord, Jayadratha finally talked to Lord Shiva as he appeared before him. The Lord had to give some boon to Jayadratha in return for his dedicated penance. At the same time, he should not forget the boons given to the Pandavas and especially Arjuna. So Lord Shiva could not grant Jayadratha the ability to kill the Pandavas as they were all powerful. He granted Jayadratha the boon that he would be able to stake off all the Pandavas except Arjuna one day when they met on the battlefield. Around the same time, Jayadratha’s father abdicated his throne after he heard a prophecy that his son would die in battle. Vridhakshtra was scared as to who would continue his family’s lineage. He set out to meditate deep in the forest. After years of rigorous penance, he asked for the boon of immortality for his son. However, the gods could not grant this boon. Instead, Jayadratha’s father was given the boon of a curse. The curse would mean that the person who would be responsible for Jayadratha’s head falling on the ground would find their head bursting into 100 pieces. Due to his severe animosity towards the Pandavas, Jayadratha was naturally on the side of the Kauravas in the Kurukshetra war. On the 13th day of battle, Jayadratha was finally able to realize his boon. Drona had arranged the Kaurava army in the Chakravyuh, a hard to break battle formation. Very few people knew how to tackle this formation like Arjuna and his son, Abhimanyu. Dhronacharya diverted Arjuna to be away in another part of the battle. 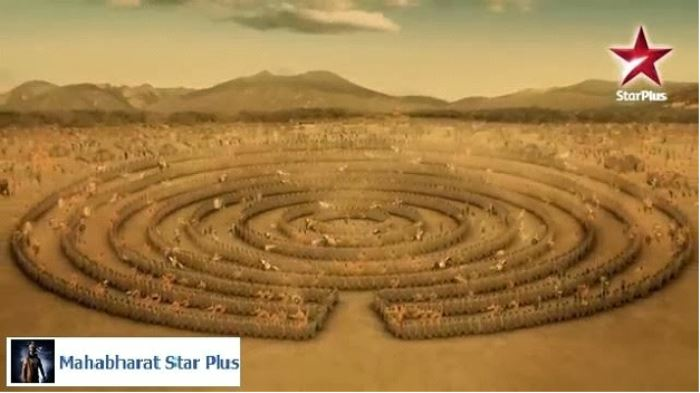 So the only choice before the Pandavas to break the Chakravyuh was Abhimanyu. However, Abhimanyu did not know how to exit this formation once he entered it. Abhimanyu asked the other Pandavas to follow him as he entered the Chakravyuh. Jayadratha closed the formation as soon as Abhimanyu entered it and sure enough, with the help of his boon, he was able to hold off the other Pandavas from entering it. What happened inside the Chakravyuh was nothing short of cold-blooded murder as the Kauravas surrounded the unarmed Abhimanyu and killed him by violating all the codes of warfare. As soon as Arjuna heard that his son was dead at the hands of the Kauravas, he broke down and took an oath that he would kill Jayadratha by sunset the next day. He also said that he would kill himself if he failed to do so. Jayadratha’s blood curdled as he heard of Arjuna’s promise. Duryodhana and the Kaurava leaders, however, were confident about keeping him safe throughout the day. Moreover, if Arjuna could not kill Jayadratha, he would have to give up his life. That would also mean that the Kauravas could practically win the war with Arjuna dead. So Drona created complex battle formations that shielded Jayadratha from Arjuna. Bhima and Arjuna tore through the Kaurava army on the 14th day of battle but to no end. The Kauravas made sure that Arjuna did not get any chance to kill Jayadratha. Close to the time of sunset, Arjuna was losing heart that he would not be able to keep his promise. Soon the sun started setting. Arjuna got ready to jump into the pyre that was ready. The Kauravas came out to rejoice at Arjuna’s defeat and impending death. The arrogant Jayadratha also came out of hiding to gloat over Arjuna. Lord Krishna asked Arjuna to kill Jayadratha immediately. Needless to say, Lord Krishna had used his Sudarsana Chakra to temporarily block the Sun and the sunset was just an illusion. Daylight shone brightly upon Jayadratha as Krishna took back his Sudarsana Chakra back. 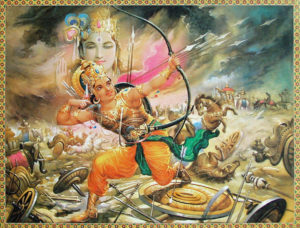 Arjuna quickly took up his famous Gandiva Bow and shot a pashupatastra, the most destructive weapon to shoot off Jayadratha’s head who was celebrating the sunset along with the other Kauravas. Arjuna made sure that his arrow carried Jayadratha’s head away and dropped it on his father’s lap, all according to the instructions given by Krishna. When the head fell on Vridhakshtra’s lap who was doing tapasya, he naturally pushed it away to the ground not knowing what it was. As per his own boon, his head broke into a hundred pieces. In this way, Arjuna was successful in taking revenge for the murder of his son. This is an important story as it shows the involvement of Lord Krishna in the war. The Kurukshetra was won only through the strategies and help rendered by Lord Krishna.